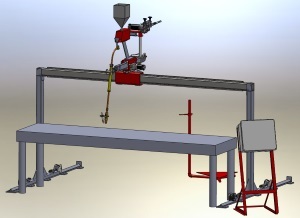 We design and manufacture weld automation for the metal build up, hardfacing, closing seam welders and metal spray applications. Industries served include metal recycling, cement, power generation, rock crushing, sugar cane shredding, steel manufacturing, dredging, oil & gas, agricultural and tank car manufacturing. If your requirements don’t fit a category you may want to visit our Process Page to see examples of what our products can do. The tank cart closing seam welder is used in the manufacturing of railroad tank cars. With automatic level adjustment, the cart is placed inside the tank and aligned to the seam. Integrated with the customer supplied turning rolls the cart uses a precision level sensing circuit to control the speed of rotation and maintain the torch position relative to bottom dead center. The design included a hopper for sub arc welding process. This is the largest version of our Vers‐O‐Weld family. The particular unit shown was specifically designed to fit around the customers weld table. To accommodate the variety of parts the main beam was integrated on a set of legs attached to a rolling rail system. The rail system allowed the custom freedom in positioning the torch over the part. 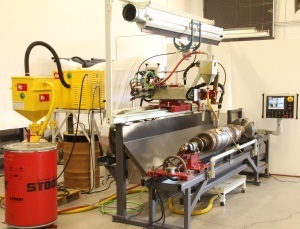 With X/Y welding motion it also included our vibratory drop carbide system and oscillating torch. The Mavrix multi-process horizontal lathe is capable of sub arc, open arc and gas-shielded welding processes using a single torch. An onboard second torch is ready for quick changeover for ID bore welding down to 4-inch ID. Target customers include those who remanufacture slab caster rolls, shell rolls, zinc pot rolls and mandrel bars, as well as other roll options. The highly flexible system permits the operator to develop programs by simply defining which axis will step or run when welding begins. Complementing the PLC is a 12-inch color HMI (human machine interface) and easy-to-use open-naming convention for part configuration storage. 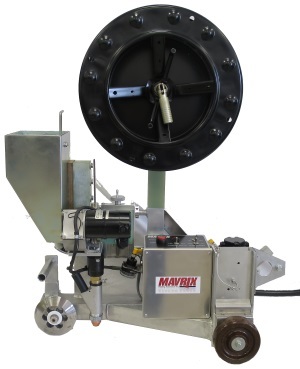 The Mavrix multi-process welding lathe is preconfigured for a wide variety of accessories including a servo oscillator, water cooler, pressurized flux and exhaust systems.